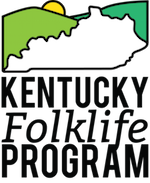 Remembering Douglas Paul Rich: The Kentucky Folklife Program is saddened to share the news that Paul Rich passed away peacefully at his home on Sunday, March 12th. Along with his wife Vennie, Paul was a long-time basketmaker from the Mammoth Cave region. After an informal community apprenticeship with local basketmaker Tony Waddell, Paul began a creative chapter in his life as he carried on the intimate techniques of white oak basket construction of the region, while constantly pushing his own creativity in new and innovative ways. He was a charter member of the Mammoth Cave White Oak Basketmakers Guild, a demonstrator at the Kentucky Folklife Festival (and other regional festivals), an award winning participant in the yearly Split White Oak Basket Contest at the Hart County Fair, and an inspiring figure in the basketmaking world who was always happy to share his traditional art with those who sought out his talent. We extend our condolences to Paul’s family, friends, and colleagues. Kentucky’s traditional white oak basketmakers are all the richer for having had Paul’s talent and friendship for many years. Next Next post: From the Archives: Fried pies for Pi Day!